A fashionable girl craves all of the best travel accessories; taking off for a weekend getaway or simply going for a long bike ride requires the right kind of bag and workout gear. The paisley printed, American made Stephanie Dawn bags are perfect for carrying all of your essentials. 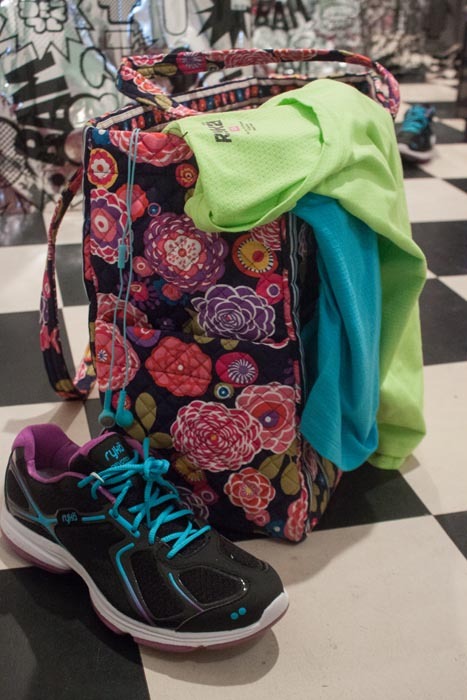 Throw on some cute sneakers and a nice workout tee by Ryka to complete the ensemble. Designs by Ryka are made specifically for women [by women]… so they tailor to all of our female needs. These black/ purple sneakers are coming soon for Fall, but there are plenty of summertime options to chose from on their website. Go for a playful bright sneaker this summer to get you excited to be on the run! The tees and tanks are moisture absorbent so they keep you feeling fresh, even after breaking a sweat. The perforated styles have a refreshing breathability to them, which is necessary for a run or hike on a hot summer’s day. Going on a hike doesn’t allow for much baggage to be dragged along. The Stephanie Dawn bag shown in a classic paisley print is a must have for occasions like this. You can pack in a few water bottles, some snacks, and take off! A blanket would also fit perfectly, for those who enjoy a post- workout picnic. This bag also comes in handy for casual weekend trips. A suitcase is too big, and a backpack is too small. There are pockets to compartmentalize what you bring, too! You can fit in a few outfits and basic travel gear in here for a simple and fashionable journey. ACTIVE weekend gear for the girls written by Bianca Scherrei.